I see from my first post on this trip that I planned to write it up sooner. Well, I won’t go into details here but 2018 has been more chaotic than I expected. Before I talk about Ketchikan I’d like to add some more comments on cruises, from my notes in transit. As I mentioned in the first post, we had 4 hours a day of seminar lectures and rehearsals. They were very interesting and I always like to sing, but the ship’s management on this round apparently wasn’t nearly as cooperative as the ones on the first cruise, and our assigned rehearsal space was an empty bar, and the only seating was backless padded hassocks. The area also had very poor lighting and very loud air conditioning. Lynne put up with that for about 2 days, then moved us to the other end of the bar, a quieter location with better seats, on the principle that it’s better to ask forgiveness than permission. We stayed in the new spot for the rest of the trip. I also have a note about formal nights, when everyone was supposed to dress up for dinner. In most cases this was just nice dresses and sports jacket, but I swear one formal night I saw a man in white tie, tails, top hat, and a cane! He didn’t sit at our table. On to Ketchikan, where I opted for the walking tour of the town. 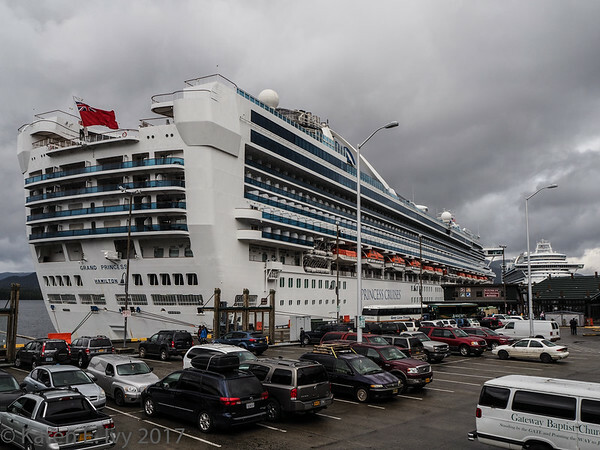 All the Ketchikan photos here, and a number of others, are in my photo gallery Ketchikan, which you can see by clicking on the link. Ketchikan’s harbor is very small, and looks even smaller when it’s full of cruise ships.